Most eye conditions do not manifest symptoms until the later stages. This is why we make it our personal prerogative to evaluate and detect ocular disease while they are still preventable and treatable. During your eye exam, Dr. Vu will evaluate the front surface of your eyes as well as take an internal look at your eyes. 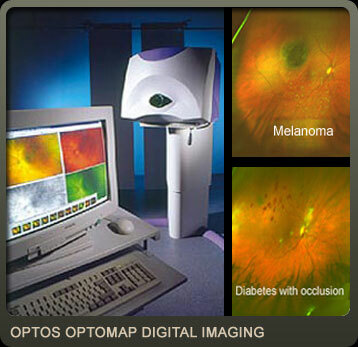 We use the Optos retinal imaging system to document and detect ocular diseases. 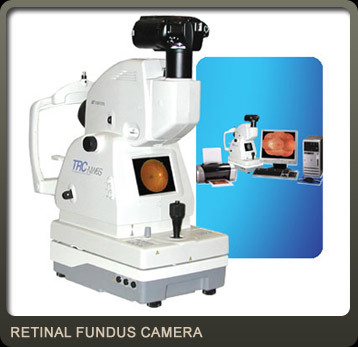 This machine is used evaluate the retina in patients as young as 5 years old. Some conditions that can be detected include macular degeneration, diabetic retinopathy, choroidal nevi, hypertensive retinopathy, retinal tears/holes/detachments, retinal scarring, and many others. You may also be dilated at your exam to further evaluate the retina. Glaucoma is a progressive condition that can potentially lead to permanent blindness. Glaucoma is often referred to as the Silent Stealer of Sight in that most people don’t notice their vision loss until it is too late to treat and control. Glaucoma is a very complex condition, with many variations as to the root cause. The most common form of glaucoma occurs when there is pressure build up in the eyes. The pressure can lead to damage to the optic nerve in the back of the eyes. If nerve signals stop sending visual information back to the brain, patients can eventually lose vision from the outside in (develop “tunnel vision”). The key in early glaucoma detection is to be proactive and have baseline information whenever there are any yellow flags at your regular exam. Once we have baseline information, we are better able to detect any structural changes in your eyes such that we talk about treatment options that can help prevent blindness. At your annual exam, Dr. Vu will evaluate the lens inside your eye with a slit lamp to detect early stages of cataracts. A cataract is an opacity in the lens inside your eyes that can be caused by aging changes, UV damage, smoking, and diabetic complications. Often, if there is a small cataract, it can be monitored. Since a cataract can cause glare issues and frequent shifts in one’s prescription, it is important to evaluate cataracts yearly to adjust your prescription and discuss options on glasses that can help you be more visually comfortable. If cataract surgery is needed, Dr. Vu will make the appropriate referral and conduct the necessary follow-up evaluations to ensure the continuity of your care.